Countries of Europe Union. lossless scalable AI,PDF map for printing, presentation. 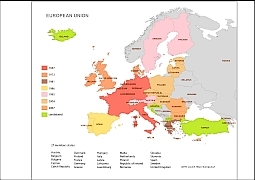 Maps > Continents > Maps of Europe continent > Countries of Europe Union. The Countries of Europe Union. (ai, pdf ) file in vector format enable the user organise level of structuring of map.